Info Edward J. Markey has constructed an extraordinary legislative record since his first election to the United States Congress in 1976. While mastering the complexities of telecommunications policy, he continues to be a champion of consumer rights, health reform, the elimination of large monopolies, and the conservation of environmental resources. Rep. Markey is consistently rated as a "legislative hero" by the Conservation Law Foundation, the Consumer Federation of America, the Children's Defense Fund, the National Education Association, and Taxpayers for Common Sense. Competition remains Rep. Markey's economic mantra in his words, "ruthless Darwinian competition that would bring a smile to Adam Smith." Accordingly, he has been instrumental in breaking up anti-consumer, anti-innovative monopolies in electricity, long-distance and local telephone service, cable television, and international satellite services. He was one of the only members of the Commerce Committee to fight AT&T's monopoly in the early 80s and is a principal author of the requirement that the Bell Operating companies accept local telephone service in the 90s. His pro-competition policies have directly benefited job creation in Eastern Massachusetts and throughout the country. In the 107th Congress, Rep. Markey remains very active on telecommunications issues, working to ensure new sources of effective competition to cable TV franchises, local telephone operators, and satellite services. Moreover, he is leading the House effort to preserve the Arctic National Wildlife Refuge as wilderness. He is also a Congressional spokeperson on energy policy generally, a key voice for providing privacy protections for personal information such as medical records, financial records, and purchases on-line. He co-founded the Congressional Caucus on Privacy. He also chairs a bipartisan Congressional Task Force on Alzheimer's Disease, as well as the Bipartisan Task Force on Nonproliferation Policy. He is the third most senior Democrat on the full Energy and Commerce Committee, where he serves on three subcommittees: Telecommunications and the Internet (Ranking Democrat), Commerce, Trade and Consumer Protection, and Energy and Air Quality. He is also the second most senior Democrat on the full Resources Committee, where her serves on the Energy and Minerals subcommittee. His legislative record spans the breadth of Congressional policymaking, as befits a national leader with a commitment to a district which includes both blue-collar and high-tech suburbs north and west of downtown Boston. Capping a 10-year effort to provide a cushion against spikes in energy prices in the Northeast, Ed Markey championed and won the battle for a Northeast Home Heating Oil Reserve in 2000. Ed won a change in 2000 in the definition of "homebound" under federal Medicare regulations that freed Alzheimer's patients to attend religious services or adult day-care without jeopardizing their in-home skilled nursing assistance. The wireless carry-it-in-your-pocket digital phone revolution was accelerated dramatically when Ed Markey's legislation moved precious airwave frequencies from obsolete Cold-War defense uses to the civilian private sector. Ed Markey has led the effort to bridge the gap between the information "haves" and "have-nots" in our society by legislating the "E-Rate", which provides telephone rate discounts to connect every school classroom and public library to the Internet. We enjoy three weeks of afterwork sunshine every spring because Ed Markey championed the Daylight Saving Time Extension Act of 1985, moving the start date of Daylight Savings Time to the first Sunday in April. Ed Markey's 1997 legislation to set minimum energy efficiency standards for major energy-consuming household appliances such as refrigerators and washer-dryers reduced energy demand dramatically and preserved thousands of acres of precious land and water that would otherwise have been needed to build 20 large electric powerplants. When your 6-year-old watches an educational program from your local commercial broadcaster, she is taking advantage of the 20-30 hours of educational programming for children required by Ed Markey's Children's Television Act of 1990. Rep. Markey is the author of the 1996 V-Chip law which led the TV industry to develop a TV ratings system to warn parents of violent or sexual content. Beginning in the summer of 1999, parents will be able to buy TV sets that can be set to block automatically TV programs or movies that contain material rated as not appropriate for their children. Rep. Markey is the author of the Wholesale Electricity Competition law of 1992 which has saved businesses, universities and other wholesale consumers of electricity at least $5 billion each year in lower energy bills. Rep. Markey's Child On-Line Privacy legislation, which became law in 1998, addressed children's privacy on the Internet by helping to ensure that that web-sites aimed at children provide mechanisms for parental consent before private information is sought or transmitted electronically. Rep. Markey's Cable Act of 1992 spurred the growth of the 18-inch satellite TV industry as a competitor to the local cable monopoly. Rep. Markey insisted on the open-access provision in the Telecommunications Act of 1996 that makes it possible for small upstarts like RCN to compete for local cable and telephone customers simultaneously. Ed Markey forced the cleanup of the Woburn hazardous waste site, among many others, by working to pass the Superfund law, and then defending this landmark environmental statute, resisting, for example, the effort to rebate tax dollars to polluters. He has also led the opposition to efforts to override environmental protections with respect to the transportation and burial of high-level radioactive waste and was the author of a provision in the Clean Air Act that rewarded utilities that adopt energy efficiency strategies to reduce air pollution. When you invest in the stock market, your nest egg is safer and less vulnerable to fraud or insider trading because of Rep.Markey's reforms of the stock, bond and mutual fund markets that were hailed by SEC Chairman Richard Breeden as "the most significant legislative reform of Wall Street" in 30 years. Ed Markey issued a seminal report in 1985 entitled "Nuclear Guinea Pigs" which became the basis for a Pulitzer-Prize winning newspaper expose and apologies by our government for sponsoring radioactive experiments on human subjects without their informed consent. Another Markey report in 1982 revealed vast and illegal underpayments of royalties owed by large coal companies for mining on public lands. The ensuing furor ultimately led to the resignation of the Secretary of Interior, James Watt. Competition remains Rep. Markey's economic mantra-in his words, "ruthless Darwinian competition that would bring a smile to Adam Smith." Accordingly, he has been instrumental in breaking up anti-consumer, anti-innovative monopolies in electricity, long-distance and local telephone service, cable television, and international satellite services. He was one of the only members of the Commerce Committee to fight AT&T's monopoly in the early 80s and is a principal author of the requirement that the Bell Operating companies accept local telephone service in the 90s. His pro-competition policies have directly benefited job creation in Eastern Massachusetts and throughout the country. 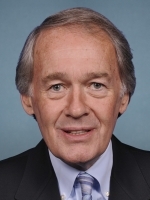 PERSONAL - Ed Markey was born in Malden, Massachusetts, on July 11, 1946. He attended Boston College (B.A., 1968) and Boston College Law School (J.D., 1972). He served in the U.S. Army Reserve and was elected to the Massachusetts State House where he served two terms. He is married to Dr. Susan Blumenthal. 09/08/2020 MA US Senate - D Primary ?? ?